I read with interest as well as much disdain, an article (1) on how people might be able to quit smoking without gaining weight. The old urban myth is that smoking keeps you thin, and if you quit smoking you're sure to gain weight. The article, published on Science Daily.com sites a new study (2) that reveals a new understanding of how nicotine behaves as an appetite suppressant. Nothing against Science Daily, it's one of the most used bookmarks I have.. love the site. Usually I defend how research drags us through the minutia of how things are presumed to work because without knowledge of facts we're doomed believe things like 'the sun orbits the earth', or 'smoking keeps you thin'. Today though I can't help but feel akin to my friends who contend that academics don't live in the real world. So science proves that nicotine suppresses appetite. Must be true then; smoking keeps you thin. Regular readers will know that I'm all about the "evidence". Don't make things up based on myth, traditionalism, and prejudging.. show me the evidence. Ok. So if smoking keeps you thin how do we explain overweight smokers? And if quitting smoking causes weight gain; how do we explain those who do not gain weight despite quitting smoking? The answer? The seemingly elusive matrix of variables that causes clandestine weight gain.. whaa? I gained weight? How did that happen? Ahh, I know how I gained fat, I don't smoke! Eureka! World wide obesity epidemic solved! Yes there it is folks, science shows us the way. The percentage of the population that smokes has decreased since the 60's. The WHO (not the band) says that smoking among Americans has shrunk by nearly half from the 60's to the 90's, with 23% of the population smoking in 1997 (3). Health Canada says that the percentage of the population that smokes has fallen from around 40% in 1985 to around 21% in 2003, with 30% of those aged 20-24 as the largest smoking group. At the same time obesity has been increasing. According to the 2004 Canadian Community Health Survey 23.% of Canadians aged 18 or older were obese (4). Well sign me up as a Nobel Peace Prize nominee (I wouldn't presume to win, but surly I should be nominated for solving the obesity "mystery"). 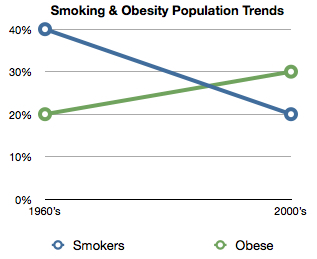 Fewer people are smoking and more people are overweight; and the trends match each other inversely. Damn my curiosity. If I weren't so curious maybe I wouldn't have tried smoking and eventually tried to quit. Wait.. something just clicked in my brain. I think my neuron just fired.. 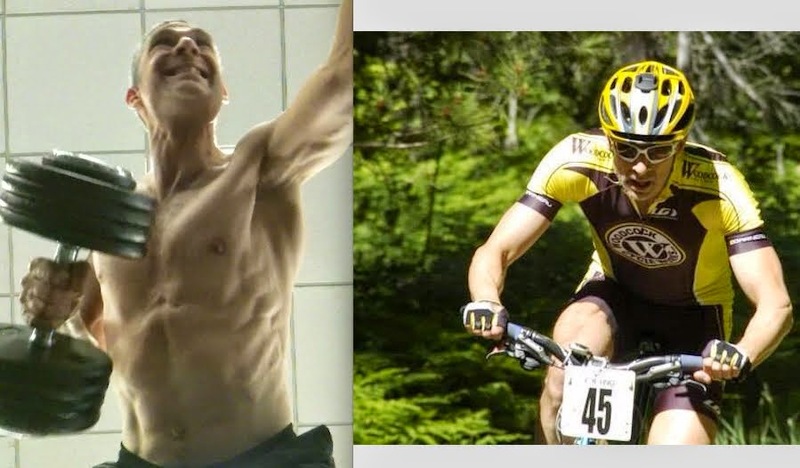 I didn't lose weight when I started smoking, nor did I gain weight when I quit smoking. Time for more research. A study published in the American Journal of Clinical Nutrition in 2008 tells us combining smoking and obesity kills us better than either of those alone (5). Must be junk science. Since smoking keeps you thin, how did these researchers find overweight people who smoke? Maybe the world repository of facts; Google, can help. "Overweight smoker" gave me this little You Tube gem of an overweight child in Indonesia with a two pack a day smoking habit. Must be a hoax. Remember; smoking keeps you thin. My tongue is getting sore and I think my cheek is developing a permanent bulge. Overeating causes weight gain, not the absence of smoking. There are many overweight people who smoke. There are many who are not overweight who do not and have never smoked. The way to not gain weight when quitting smoking is to not eat too much. The health benefits of quitting smoking are huge and it feels great to rid of the ball and chain. It takes some mindfulness and contemplation of healthy food choices, but for sure the fear of weight gain ought not to keep smokers from quitting. Don't let a belief in an urban myth keep you from becoming a healthier non-smoker; ditch the darts and eat healthy, you'll love yourself for it.